Rajma (Kidney beans) is cooked quite often in north Indian houses. Its very high in protien and has good nutritional value. Cooked in tomato gravy gives it a very tasty, mildly tangy flavour and it goes well with steamed rice. 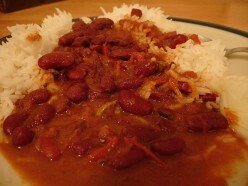 Rajma Curry has a beautiful dark maroon colour, much similar to the colour of kidney beans. 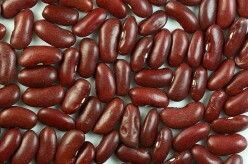 Kidney beans also comes in a variety, but I prefer small and dark maroon ones as they taste yumm when cooked. These are also called as Jammu Rajmas, named after a Indian State. Prefer Basmati rice to accompany the curry dish.To make my recipe simple I’m not considering garam masalas like cinnamon, bay leaf, pepper corns, cloves etc, but you can use them if you have an idea of their proportions. Cook and enjoy this recipe with rice. Being a high protein diet, it’s to take it as lunch than dinner.